One of the best things about being an experienced producer is knowing exactly what kind of gear you need in your studio. When it comes to condenser microphones, chances are that your next acquisition needs to be more versatile and functional than the last one. Today we are going to show you our top picks for the best condenser microphones you can get under $300. These are easily some of the best condensers on the market, especially if you appreciate a good performance to price balance. After we go over our picks we’ll discuss what this category has to offer. Proven and reliable chassis offers plenty of ruggedness and protection. A whole new set of hardware that adds a boost in the performance. One of the best balanced condensers out there at the moment. At this price range, AT2050 is lacking in aesthetics. Audio Technica is one of those brands that really know how to cater their products for optimal performance. Looking at Audio Technica AT2050 tells you everything you need to know about the truthfulness of this statement. This mic combines the already existing design with a more advanced hardware package, all of which results in one rather capable condenser mic setup. If you’re wondering just how similar it is to the AT2020, rest assured that any similarity is only skin deep. Audio Technica might have used the same chassis, but the hardware is more or less a whole new setup. The performance and reliability of this model are great. With adjustable polar patterns, you can really push the limits when recording. One of the most functional mics to be released lately. A robust and durable chassis that still looks great. Dual circuit paths including both a digital and analog one. Features only one color option unlike other Yeti models. 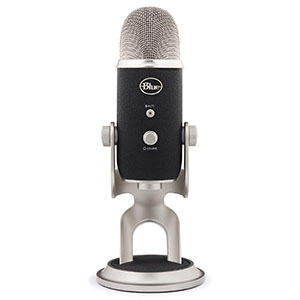 he moment it first hit the market, Blue Yeti made a whole lot of noise and sent ripples across the industry. It was a perfect combination of performance and style which has attracted a number of entertainers across various media. Blue 1967 Yeti Pro offers a better, more refined version of that experience with a few additional features that matter. Aside from its somewhat retro design, this microphone actually stands out compared to your regular Yeti. Whereas the original used USB for everything, this Yeti allows you to use an XLR output should you want to. In other words, there are two separate circuit paths inside, a digital and analog one. That type of profile is fairly rare out there. A stylish and classic design that is reliable. Good performance even under not so usual circumstances. Good polar pattern and noise management abilities. The resolution it's capable of is slightly behind the norm. The time when condenser microphones were confined to large recording studios is long gone. Nowadays a condenser can be quite mobile and functional outside of its original parameters. 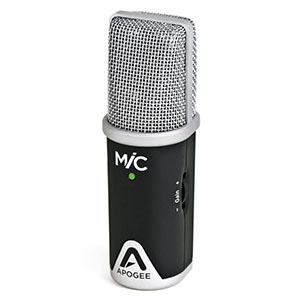 Models such as Apogee MiC reveal more on this subject. This microphone has the styling and core build of a standard condenser but that is where all similarities end. Apogee MiC offers a great solution for traveling artists who want to capture the natural sound of their instruments on the go. As you can probably tell, this is a USB mic which means that no phantom power is necessary. I terms of performance, it does a great job with noise and offers a pretty tight audio all things considered. Are $300 Condensers Microphones Worth It? No matter who you are and what you intend to do with your microphone, the answer to this question is a strong yes. If you have found enough reasons to get a condenser in the first place, then a $300 model like the ones on our list is going to be a justified investment. With that said, upgrading to a condenser in this price range makes perfect sense as well. If you’ve had a budget condenser and have decided to upgrade to something that packs a bigger punch, this is where you should start your search. We have to talk about the most important unwritten rule when it comes to investing in microphones at this point. No matter which mic you get, it won’t be your only one. Microphones are like tools with each being designed to be good at a very specific application. this is even more true with condensers. A $300 condenser will be a great addition to any collection but that doesn’t meant that you $500 model is going to be left without a job. On the contrary, by having more than one mic in your arsenal, you will be able to dedicate specific units to specific jobs. Generally speaking this need for a versatile collection of mics comes with time and experience. If we were to look at the very core components of these condensers, chances are that you would find a pretty similar hardware as that found in a good $200 condenser. Capsules and diaphragm assemblies are not that often changed but they are fine tuned. On top of that, you are getting all of the advanced features. Those alone are worth investing in. In this segment of the guide we will be talking about which features you can expect to see and how they can impact the performance of the microphone and your overall experience. This is a big one. Polar recording patterns define how versatile a microphone is. The standard cardioid pattern is good when you don’t mind picking up a bit of environmental sound. However, when the occasion calls for a more precise job, you will quickly find out that muscling that cardioid pattern to fit the bill simply doesn’t work. Because of that, it is great when you can just select different polar patterns. How many patterns you will have access to is going to depend on the microphone you get. In most cases there will be at least four different polar patterns. Aside from them actually making your life easier, learning how to use these polar patterns is crucial if you want to get into more complex recording. Another new thing we see in this price range are hybrid designs. This is where models such as the Blue 1967 Yeti Pro fall into. At this point you are probably wondering why would anyone need a hybrid condenser? The answer is actually quite simple. Although it is quite practical, your average digital circuitry is still fairly lacking in quality when compared to a standard analog one. If you are doing podcasts only or using your mic to record stuff for personal use, you probably won’t notice this difference. However, the moment you go professional and start recording music that is going to be published somewhere, you will run into problems. For those occasions, it is great to have a separate analog circuit that can take the same amount of load but produce a more refined end product. This category is also the one where you will run into actual high pass filters. A high pass filter removes certain frequencies in the lower portion of the frequency range, thus making your recording more clearer and easier to work with later on. Keep in mind that a high pass filter isn’t there to make your voice or instrument sound higher than they are. This feature was actually meant to eliminate unwanted noise before it ever reaches the mixer. It is one of those tools that really make your life easier when you start mixing tracks. Being able to get familiar with a high pass filter using what is essentially still a budget microphone is great. The key with figuring out what kind of mic you want to get is the same no matter how much money you are able to spend on it. Knowing your intended use before hand will make the entire process very easy. 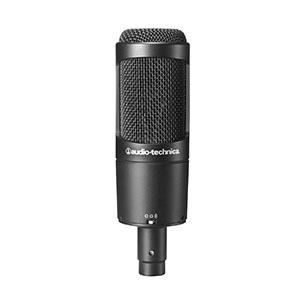 If you need a studio workhorse, then something like the Audio Technica AT2050 is an obvious solution. However, if you need something that will work on the go, the Apogee model might be a better fit. It all comes down to the application. All things considered, this segment of the market is probably the most exciting one when it comes to condenser microphones. The cross section of features, hardware and overall quality is simply great. From all of the models listed above, we would have to stick with Audio Technica AT2050 as our top choice. This mic is a proper studio workhorse which packs all the right features in all the right places. It can do vocals but also acoustic instruments. With that said, no matter which model you choose to go for, you won’t regret it down the road, that’s for sure.